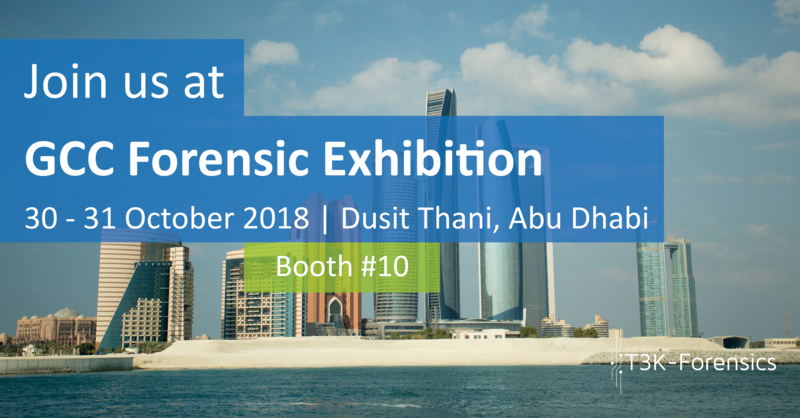 T3K-Forensics is going to the GCC Forensic Exhibition and Conference (October 30-31, Dusit Thani, Abu Dhabi), presenting its unique analysis software LEAP, which analyses mobile phone extractions (UFED, XRY) within a few minutes. Are you interested in a live demo of LEAP? Visit our booth #10 and be amazed! With the development of LEAP, T3K set out to revolutionize the analysis of big amounts of smartphone data, by automating time-consuming work with the use of artificial intelligence. Through the automated analysis process, viewing time of emotionally challenging content can be minimized. LEAP allows the use of smartphones to identify persons, as well as to probe for possible incriminating material – for example at immigration checkpoints or in ongoing mobile forensic investigations.